Cat People was the first of a series of horror films produced by Val Lewton during the early 1940s. It was directed by Jacques Tourneur, who would next team up wit h Lewton to make the sublime I Walked With a Zombie (1943) and would later direct the classic film noir, Out of the Past (1947). The film was a great commercial success on its release, but only gained critical acceptance much later. The enduring qualities of the film lie in its superb black-and-white production values that were used by Tourneur and Lewton to evoke fear of something unknown lurking in the darkness. In fact, the film relies entirely on our imaginative dread of the unknown. The film opens with a quotation from the fictitious Dr. Louis Judd, who is actually a character in this film – a psychiatrist whose later romantic interest in the main character proves to be his undoing. The same character, played by the brother of George Sanders, Tom Conway, also appears in Lewton’s later film, The Seventh Victim. For reasons that become clear as the story evolves, Cat People can then be considered a sequel to The Seventh Victim, but the two films have no other linkages beyo0nd the commonality of the Dr. Judd character. 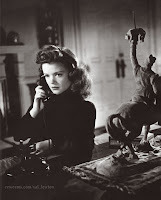 In addition, Cat People is also a prequel to the later The Curse of the Cat People (1944), although the plot connection between those two is also not very strong. The opening scene in a city zoo shows a pretty young woman, Irena (played by Simone Simon), making sketches of the black panther in the cage before her. She meets there a young marine architect, Oliver, who is eager to strike up a romantic acquaintanceship with her, and in no time at all he manages to get himself invited back to her apartment. The dimly lit apartment is visually spooky, bedecked with numerous cat images. Oliver’s fascination with a small sculpture in the apartment, depicting a knight who has impaled a cat with his sword, leads Irena to reveal a little about the legends of her Serbian background. It seems that at one time the country was victimised by evil “cat people” who were eventually routed from the country by “King John”, the subject of the table sculpture in her apartment. But Irena says, menacingly, that some of the cat people escaped to the mountains and continued their evil ways. It will soon become clear that Irena fears that she is descendent from the cat people. Subsequent scenes showing animals (“Mother Nature”) becoming agitated in her presence suggest further that there is some disturbing element inside Irena. Nevertheless, their relationship deepens and Oliver proposes marriage, but Irena still refuses to kiss Oliver. She is fearful that her suspected evil nature will turn her into a vicious cat, a black panther, if something arouses her passions, whether love or jealousy. Although they go ahead and marry, Irena’s inhibition prevent any physical contact with Oliver, and so the marriage remains unconsummated. Oliver recommends that Irena visit a psychiatrist (Dr. Judd), who assures her that her superstitious fears are all in her mind. Meanwhile the frustrated Oliver is spending more and more time with his office friend, Alice. Irena soon becomes mindful of this budding romance, and becomes jealous. One evening she sneaks out to see what Oliver is doing so late at the office, and observes through a nearby restaurant window a chance meeting between him and Alice. When Alice sets out to walk home alone in the dark, Irena follows her. This sets up a celebrated scene, lasting only about minute and a half, in which Alice becomes increasingly fearful of being stalked by someone out of view. The tension builds to a fever pitch, as Alice becomes terrified. Finally, what sounds like the terrifying growl of a panther (to us, anyway), turns out to be the screeching brakes of a stopping bus, which Alice boards in relief. Nothing happened, and our fears are quickly dissipated. Lewton was to repeat this kind of ominous, nighttime stalking scene with equally chilling effect in The Seventh Victim. The streetwalking scene is followed by another celebrated scene, in which Alice goes for a lone, nighttime swim at her hotel and fears that some fearful beast is lurking in the shadows. This scene, too, is quite short, and there is nothing threatening clearly identifiable, other than suggestive shadows reflected off the rippling waters of the swimming pool. Alice screams, and when the lights come on, Irena is seen standing in the corner with a benign smile on her face. Once again, it was only a false alarm, and our fears could be interpreted as simply overwrought imagination. The plot now quickly moves towards its conclusion. Irena, having become convinced by Dr. Judd that her fears are only delusions, resolves to consummate her marriage. But Oliver reveals to her that it is too late; he now loves Alice. Irena sinks into a dark despair, and Oliver goes off to consult with Alice. Dr. Judd, now romantically attracted to Irena, sneaks into their apartment in hopes of catching Irena alone. But when Irena comes home and he tries to seduce her, he is attacked by a shadowy beast and mauled to death. Irena then runs off to the zoo and sets the caged black panther free, but she is killed in the act. This film has some truly outstanding cinematography, wonderful set design, skilful editing, and good acting performances by all concerned. Simone Simon is particularly attractive as the kittenish Irena who descends into the depths of feline mystery. There is something eternally fascinating about cats. Whenever I see one, I am always amazed how it can often be so cute and, at the same time, so capable of disconcertingly vicious behaviour. This is something apparently intrinsic to our eternal fascination with the mystery of cats, and the filmmakers have manage to summon up that fascination in the personage of Irena. So from these production values, alone, the film is worth seeing. But the film also suffers from serious flaws. After Irena stalks Alice on the streets, we are shown some sheep that have been slaughtered by a beast. Pawprints leading away from the slaughter are shown to gradually turn into footprints from a lady’s shoes. The only interpretation here is that a panther transformed itself back into Irena. When Dr. Judd is attacked and killed, we actually see a panther attacking him, in one fleeting shot. Again, the only interpretation here is that Irena transformed into a real panther. At the end of the film, when Irena is shown to have died in front of the panther’s zoo cage, there is a momentary final shot of a panther wearing Irena’s coat and lying dead on the sidewalk. These three scenes, which destroy our suspension of disbelief, were forced upon Lewton by the RKO studio over his objections. He managed to have enough artistic control in his later productions to resist this kind of pressure for cheap shock effects. There are a few other odd things about this story. Simone Simon’s character is so innocent and sweet most of the time, perhaps too sweet, that there doesn’t seem to be any ominous potential of something dark lurking inside of her. This is perhaps a weakness. We need a bit more foreshadowing of the evil that is to overtake her. Cigarette smoking is almost obsessively displayed by Oliver, Alice, and several others in the film. These are supposed to be the “normal” people, but the cigarette-smoking behaviour on display suggests a fetish and its own kind of dysfunctional personality. The assumption (discussed towards that latter stages of the film) that Oliver and Alice can have Dr. Judd put Irena away permanently in a mental institution reveals a certain sickness of its own about the mental health community that exists in society, even to this day. In fact the serpentine and slimy Dr. Judd is such a caricature of an intellectually dubious profession that one suspects Lewton and Tourneur were having their own private joke at the expense of psychiatry (then in its Freudian heyday). There is a kind of negative, anti-feminine tone to this tale. “Normal” women are shown to be sunny, down-to-earth characters – good chums, so to speak. The mysterious, alluring aspect of femininity, even sexual desire, is seen as cat-like – dangerous, unpredictable, psychotic. This is a view that I reject. These elements are interesting, but they prevent Cat People from being a masterpiece. The true masterpiece was soon to come, though: I Walked With a Zombie.